Addiction will release a Tokyo Jazz holiday coffret (7200yen) on 7 November in Japan. 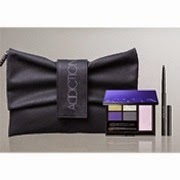 It includes Tokyo Jazz Limited Compact, Black Jazz Eyeliner Pencil and a ribbon clutch. The compact contains four pearl shades of mustard yellow with gold pearl, translucent pale yellow with large silver pearl, grey with silver pearl, pale sakura pink with silver pearl, and a matte iris purple.